The Plot – Spoiler alert! : Twelve-year-old Michael Arroyo’s pitching arm is incredible – so incredible that he should have it made. It seems that he shouldn’t have a care in the world, but nothing could be further from the truth. In the first pages of Heat, readers are introduced to Michael, his seventeen-year-old brother Carlos, and many of the friends he’s made in his neighborhood in the South Bronx. But although his sons talk about him often, Michael’s father never makes an appearance, and eventually we learn why: Michael’s father died suddenly several months before. It was his final wish that his sons stay together. But there is no one to take them in, since the Arroyos left the rest of their family behind when they fled Cuba for New York, and Carlos and Michael worry that Children’s Services will split them up if they go into the foster care system. So, they craft an elaborate lie, trying to hold out until Carlos turns eighteen in a few months and can serve as Michael’s legal guardian. Meanwhile, Michael’s fastball is causing jaws all over New York State to drop, earning him lots of attention as his team dominates the local competition in their quest to make it to the Little League World Series. But a formal complaint is lodged by jealous coaches of rival Little League teams, claiming that Michael must be older than he says he is. Michael’s father left much of the family’s paperwork behind when they fled Cuba, and without his birth certificate Michael is banned from playing with his team. After having a spat with a new girl in the neighborhood, the first who has ever turned Michael’s head, it seems that everything in Michael’s life is going wrong. But, with the help of his friends, things turn around for Michael just in the nick of time, and all of his problems are solved in one immensely satisfying, if somewhat improbable, scene. Our Take: Mike Lupica serves up a winner with Heat. Michael is, perhaps, a little too good to be believed -- honest, athletically gifted, kind, funny, humble, grounded -- but you could hardly ask for a better role model for young athletes. And his commitment to maintaining all these admirable qualities, even while dealing with the anguishing hard knocks life has dealt him, will be inspiring to young readers. Parents don’t need to worry about whether they should let their child read another sports book or make him/her read a “quality” book instead; Heat has it all. Lupica’s descriptions of games are nail-bitingly vivid, revealing his “other” job as an ESPN commentator and sports columnist. Young baseball fans will relate to Michael’s fixation on the sport and learn a lot about the importance of practice, tenacity, sportsmanship, and friendship. But this book will appeal even to those who aren’t captivated by America’s pastime. The book is filled with humor, in large part thanks to Michael’s irrepressible best friend and catcher Manny. Its plot is compelling and its writing is exceptional. 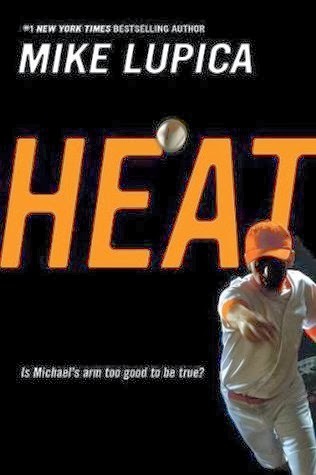 We highly recommend Heat to baseball lovers, dreamers, and everyone who loves a well-told tale. Interesting Background: Lupica was inspired to write Heat by the Danny Almonte scandal. In 2001, it was discovered that all-star South Bronx pitcher Almonte had lied about his age, saying he was twelve instead of fourteen so that he could star on a Little League team of younger players. The scandal is mentioned several times in the book.